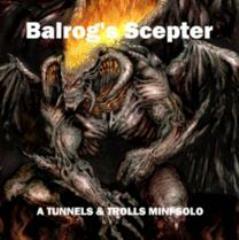 This unique solo, printed with full-color covers in 48 pages of a 7" x 7" square size, was designed to be used with either Tunnels & Trolls™ or Monsters! Monsters! rules. And, yes, you can play any race you want to play! "You are awakened from a deep slumber by a strange noise. You sit up quickly, listening for the sound to be repeated. Suddenly it comes again—and it originates from the foot of your bed! The noise is a loud squawk from a large black raven perched upon your bedpost. In one of its talons, the raven holds a gold ring, which it promptly drops at your feet. With a final squawk, the raven then spreads its wings and flies out an open window. You pick up the ring to examine it in the light of the sunrise. It is masterfully crafted and set with a ruby the size of your thumbnail. Out of curiosity, you put it on your finger. Suddenly, there is a loud ‘POP!’ and a searing white light momentarily blinds you. When you can see again, you realize that you are no longer in your room, which certainly did not have the stone walls, stone ceiling, and stone floor of your new location. More ominous still, there are no windows in the room—and no door!" For a mini-solo, it is very thick and filled with over 33 pieces of eye-popping artwork.